Here are some of the kinds of projects we've been working on together. The Hand in Hand festivals are a chance for the LGBT choirs of Asia to get together. The inaugural Hand in Hand Asian LGBT choir festival was put together by G-major Chorus in Taipei in October 2015. Find out more abou the festivals here! Various Voices is the 4-yearly international LGBT choir festival which takes place in Europe. Dublin 2014 saw participation from Asian LGBT choirs for the first time in the history of the festival. It was also the first time any Asian LGBT choirs had ever performed outside their home countries. 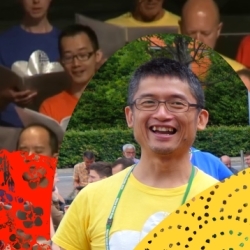 We were very pleased to be able to bring two choirs - the Beijing Queer Chorus and G-Major Chorus, Taiwan - together with choirs from Proud Voices UK & Ireland to create a special choir which performed on stage on Monday 16 June 2014 at 12 noon in Mahony Hall. I had absolutely no idea how VV would turn out right up to the moment of my departure. I only started to realize how big an event VV was at registration. Astonished by the opening concert, I was finally able to start taking pride in my identity and participation. After watching various groups perform, I started to realize that singing technique was not the focus, but that everyone is a champion, a winner just by being here. Every night, everyone felt something deep which touched their heart. Every party was like a true Utopia where the world seemed to unite. Every look was warm as we comforted each other. And though my mother tongue is not English and I come from the Far East, the praise and support from everyone helped me to blend in like I had always belonged here. My eyes were full of tears, for there were endless sensations and love. My life will never be the same, and being a part of Various Voices will be the pride and honour of my life, forever.